Are UFO’s Really for Real? Is that a flying saucer?! 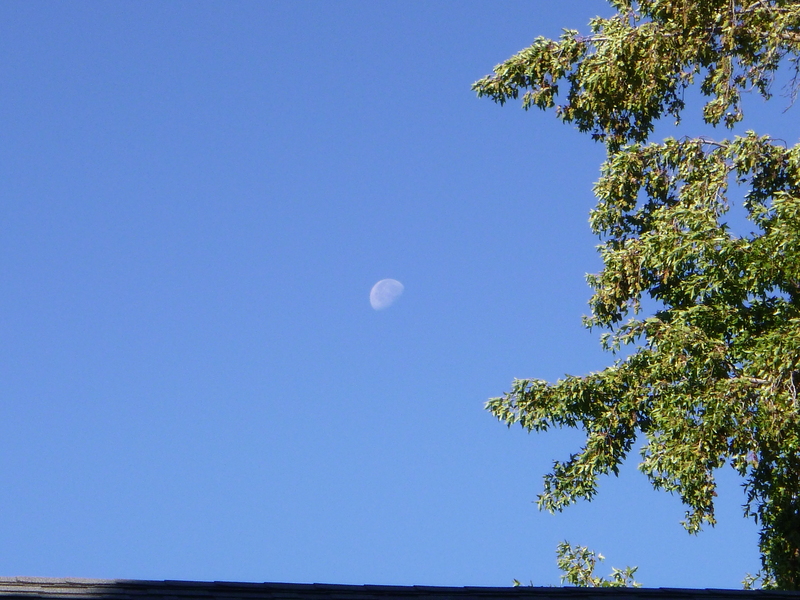 No, it’s only the moon by a tree. It looks strange and distorted because the picture was stretched for this site. Every so often there will be a news story about a UFO sighting and invariably, various questions come up, including, ‘Have you seen them?’, and, ‘Do you believe in UFO’s?’, among others. UFO’s are certainly a mystery and invite all kinds of theories. Perhaps the real question that should be asked is, ‘Are any of them alien spacecraft from other worlds?’. I’ve always been interested in astronomy, science fiction, and the possibility of intelligent alien beings. If intelligent life is out there in the universe, what are they like? Are they confined to their home world, or have they been able to reach the worlds of other stars, and could they be visiting us now, or in our past or both? Like many people, I’ve read and have seen documentaries about the possibility of alien visitations and UFO’s and here’s what I think based on what I’ve seen, read, and heard. The pictures in the UFO books that I’ve read are often not real clear and it’s possible that some are hoaxes and some could definitely be real. Many can be duplicated, especially today with photo editing software. Many of these pictures look as if someone threw something round, such as a hub cap, plate, or frisbee, into the air, and just got a good shot of it with a camera. Others are often pictures of rounded clouds, particularly lenticular clouds, which can really look like flying saucers. Most of these are probably not UFO’s or specifically, alien spacecraft, BUT, considering the technology required for an interstellar journey, if any aliens are visiting us, they could have the technology that can make their spacecraft look like an ordinary cloud. Speaking of clouds, one picture that I’ve seen in a number of UFO books is one taken in October of 1957, of a very white, ‘too bright‘, cloud over the Sacramento Mountains in New Mexico. According to experts, the ‘cloud’, is too bright to be a normal cloud. It may or may not be an alien craft, but it is unusual enough to be noted. There appears to be two extreme camps regarding the subject of UFO’s. One consists of people who believe that anything, especially anything in the sky, that cannot be immediately explained, is automatically an alien visitation. All UFO’s are alien spacecraft, and all pictures in UFO books are real alien craft. And the Roswell incident is absolute proof that an alien craft crashed there and that the government, at the very least, has possession of both the craft and the alien corpses. Some believe that the government has live aliens in custody as well. The other camp consists of people who not only don’t believe that UFO’s could be alien spacecraft, but refuse to believe that aliens could exist and that everything has a human or Earth-based explanation. Many believe that UFO’s simply don’t exist, and that anyone who even mildly believes some UFO”s could be alien craft, are absolutely crazy. What do I think? Firstly, I do think that there is intelligent life elsewhere in the universe, that we could have been visited, and could still be visited now, by alien beings. Do I know for sure? No, of course not. So far, all of the evidence I’ve seen, heard of, or read, has been through others’ accounts, pictures that were not clear, and my own few sightings. As for my own sightings, while I absolutely know I saw something unusual, I cannot rule out other reasons for them any more than I can rule out the possibility of what I saw to be alien craft. But I definitely do keep an open mind, especially when the universe is so large and we only have partial knowledge of our own planet! I would find it to be incredibly profound if we did find that we were all alone in this vast universe! Twice, I’ve seen what I could call ‘true’ UFO’s. One night, in a suburb of Los Angeles, me and my cousin were outside. He said, “Look at that!” I looked up and, being a hazy night, As is often the case in Los Angeles, I couldn’t see what he was looking at. Then, I made it out. It looked like a hazy or fuzzy ‘V’ shaped cloud, moving very slowly southward. It didn’t change shape, and it wasn’t very prominent. It eventually moved on and disappeared, but not like a cloud that would change shape as it did so. Later, I thought that this could have been a flock of birds migrating south, but some things I remembered about this sighting and experience later, told me that this wasn’t so. First, Los Angeles is too far south to be along the migration routes of most birds, and those that do pass Los Angeles’ latitude are more likely to do so out over the ocean. More likely, Los Angeles’ latitude would be the destination of most migrating birds. Also, while the ‘V’ shape formation of migrating birds is what is often depicted in pictures and books, the fact is that migrating birds are rarely in this exact formation, and the formation often changes as they fly. Having moved to the Pacific Northwest, I’ve noticed this when the Canada Geese migrate in the Fall. Also, they often honk as they fly, so you hear them, even if they are high in the sky. I heard no honking when I saw this UFO,and, as I mentioned earlier, it never changed shape. The other ‘true’ UFO I saw, was when I was stargazing with another of my cousins. It was a brilliantly clear night. Again, my cousin saw it first and pointed to it. I saw it, too. It looked to be twirling and was luminous, but didn’t leave a trail as a meteor would, nor did it look to be on fire or have a glare to it or around it as a meteor or falling space debris from a satellite or rocket might. It was ‘lower’ than the stars and moved quickly from northeast to southwest and abruptly disappeared in the constellation of Cygnus, never reaching the horizon. All this in the space of 3 seconds. It made no sound and was not a plane or helicopter flying normally nor in distress and crashing. Other times, I’ve seen things that I thought to be UFO’s, only to find that they were planes or other things recognizable to any of us. Sometimes it was a small plane of such color and at such an angle that it’s wings resembled a flying saucer. Then it would turn and the sunlight would show the wings attached to the fuselage, which would now be visible as well, and I would see that it was a plane. From things like this, I can see how people can mistakenly claim to have seen a UFO, that really wasn’t, and this could be true of some of the accounts in UFO books and reports as well. But, if some of the accounts I’ve read are true, then these people certainly did see something that cannot be explained, and quite possibly, they did see an alien spacecraft. And Roswell? I read a book by Kevin D. Randle, a science fiction author who was also in the Air Force Reserve and is an authority on alien abduction. In the book, “Operation Roswell“, he includes an ‘author’s note’, in which what he says gives credence to the idea that an alien craft was indeed recovered during the Roswell incident. As for myself, I do not believe that ‘it was just a weather balloon.‘ I do have two theories. One, that an alien craft did crash there, possibly yielding alien corpses as well as alien technology. My other theory was that an alien craft crashed somewhere else, and that Roswell was indeed set up as a diversion, so that the authorities could be sure that Roswell would draw all the attention to a place where no answer could be found. In either case, this would mean that an alien craft did reach our planet and that there is conclusive evidence and the officials who know are keeping it under wraps. As for the possibility of old and even ancient art and structures being evidence of alien visitations? Such as the Pyramids, Nazca Lines, and petroglyphs around the world? And strange paintings and stories from ancient times through the Renaissance? I truly am not sure. I’ve heard arguments on both sides that sound reasonable. I truly wish I could have been there to see the art created, structures constructed, and the sources of the stories to find out for sure if any of them were indeed influenced or created with alien help. So for now, while there is much evidence, it seems to be more of a circumstantial nature. But, if there are aliens, and they are visiting, I’m sure that someday, we’ll have ‘it‘, the evidence that cannot be ignored, denied, nor hidden from the population at large. In the meantime, keep watching the skies. If you like what you’ve read, please comment and let others know of this site! This entry was posted in My Posts, Speculation. Bookmark the permalink.